The caféfrancophilo on the theme of: Le Luxe, c’est quoi? This evening's presentation on La Nouvelle Vague, given by Solène GUICHARD, drew a large attendance of around 40 people with many new faces at this the first talk of the cercle's new season. Solène prefaced her presentation with a slide of an important building in Paris inviting her audience to say where it was. Having been there back in 2012 for a memorable exhibition of Tim Burton's work I ventured La cinemathèque française. Yes it was, but what I didn't know was that it was so influential an institution among film makers that without it there would have been no Nouvelle Vague. As a concession to her large audience that included francophile as well as francophone participants, Solène switched effortlessly between French and English to introduce key directors and artists associated with the genre. Next she engaged in an étude comparative between two films (Renoir, 1939 and Resnais, 1959) showing very effectively how the cinematic styles differed from one another: inside/outside; large crew/small crew; much/little equipment; famous/unknown lead actors and the differing reliance on character and text. In a most interesting segment on the Resnais film, Hiroshima Mon Amour, she talked about le cinèma littéraire highlighting the screenplay for the film which had been written by Marguerite Duras. Solène's talk moved to focus on what for her were les deux plus grands films de la Nouvelle Vague: François Truffaut's Les 400 Coups (1959) and Jean-Luc Godard's À Bout de Souffle (1959). It was clear from audience comments that many listening considered these to be among their favourite films also. Solène concluded with a quote from Jean-Luc Godard, "All you need for a movie is a gun and a girl !" which provoked a lively exchange of questions and answers that probably could have gone on for quite some time, and certainly beyond our appointed finishing time, had our own film enthusiast, Philip, not stepped into director mode with his Lumières ! Caméra ! On tourne ! and brought proceedings to a close with rounds of audience appreciation for an excellent talk. Solène. Un très grand merci ! Solène Guichard explores the enduring cinematic legacy of the French Nouvelle Vague. Solène's talk will be in French and she has organised English subtitles to assist with important points. During her 45 minute presentation she will consider the Qui, Où et Quand aspects of La Nouvelle Vague and draw comparisons between key films. She will highlight important examples of the genre. It promises to be a blow by blow account that will leave you breathless. Note that QFT will be screening Jean-Luc Godard's “Une femme est une femme” this month. For details see 'French Films at QFT' below. Upstairs in Maddens Bar, Berry St, Belfast. Following the new formate there will be a 30 minute dance workshop at 5.30pm (a chance to learn the steps) followed by dancing from 6-8pm. Showing in the Oriel Gallery at Antrim Castle Gardens, Matisse: Drawing with Scissors, is a Hayward Touring Exhibition from the Southbank Centre, London and will be on display until Sunday 18 October 2015. Don't miss the chance to see these wonderful lithographic reproductions of Matisse's work, so full of colour an energy that is hard to believe they were produced by an elderly man in the last years of his life, confined to bed. Click on the link below for further details. A failed assassination attempt links Killiney Bay and Napoleon. This talk will outline the defences of the bay against a French invasion (1793-1815) and the subsequent history and recent restoration of one of the Martello Towers (including display of a scale model). To mark the passing of Sam Rohdie earlier this year, the School of Creative Arts at Queen’s University Belfast and QFT have organised a screening and seminar dedicated to the work of Jean-Luc Godard. In 1999, Sam was appointed as the inaugural Professor of Film Studies, and throughout his tenure at Queen’s the subject first developed its current undergraduate and postgraduate pathways, and initiated a number of important external collaborations. A compelling, controversial teacher and critic, Sam’s work increasingly concentrated on the cinema of Godard during and after his time at Queen’s. This event is an acknowledgement of Sam’s passionate engagement with arguably the most important figure in postwar European cinema. The event will include a screening of Une femme est une femme (A Woman is a Woman, 1961), introduced by Professor Geoffrey Nowell-Smith (Queen Mary), and an illustrated talk on Godard’s more recent work – especially, his Histoire(s) du cinéma - given by Professor Rod Stoneman (NUI, Galway). Tickets £3 (FREE admission for students). For more information contact Des O’Rawe, d.orawe@qub.ac.uk. The life-and-loves of a free spirit at sea. The ‘journeys’ that Alice (a wonderful Ariane Labed – who also appears in The Lobster) sets off on are physical, sexual and emotional. She has become a sailor – working as a mechanic on freighters – not necessarily to see the world but rather to find herself. When she boards the rickety Fidelio as a last minute replacement for a crew member killed in an accident, she finds the captain is her former lover Gael (Melville Poupaud). Mother/daughter relationships are at the centre of this story of North African-born cleaner, Fatima, and her family living in France. Conflict and alienation inside modern French society is exposed through this sharp, insightful and warm slice of life. Wheelchair-bound teenager Julien is the apple of his mother’s eye, but he yearns for the approval of his brooding and bitter father, Paul. With his youth as an Ironman champion behind him, Paul distances himself from his disabled son. When Julien suggests the seemingly crazy idea that they join forces to compete in a triathlon in Nice, an incredible journey of persistence and determination begins. Inspired by a true story, this is an emotionally involving film that will melt the hardest heart. In this profoundly moving drama, a talented young boy’s ailing mother sends him from their trailer park home to live with her parents. But instead, he decides to seek out his long-absent father, a famous conductor who is visiting a nearby town to present a Mahler symphony. Initially hostile, his father’s feelings slowly shift from an awkward tenderness to possibly love. Winner of the Laterna Magica Prize and the Marcello Mastroianni Award at last year’s Venice Film Festival. When Cathy’s newly hatched duckling mistakes best friend Margaux as its mother, it’s up to Margaux to live up to the role. But this scenario is at odds with Margaux’s parents who are determined to send the hatchling to the local duck farm. The third film by brothers Yves and Olivier Ringer is about the desire to be normal, and the need to be independent while celebrating family, friendship and responsibility. Winner of Best Film at the Montreal Children’s Film Festival. 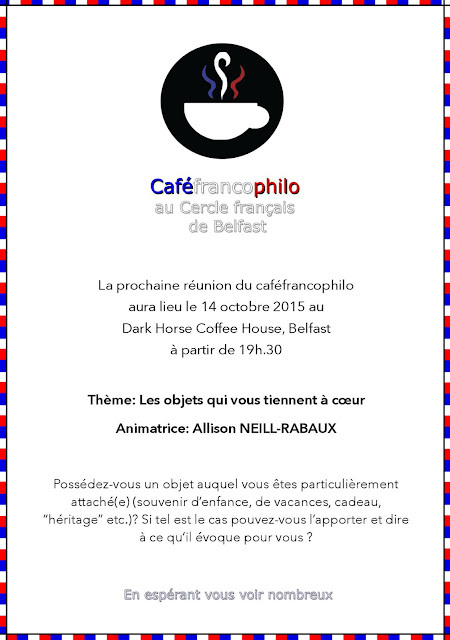 Looking forward to seeing you in the Dark Horse Café on Wednesday 7th October.